I just want to throw out a request to help vote for my local running store: Potomac River Running. 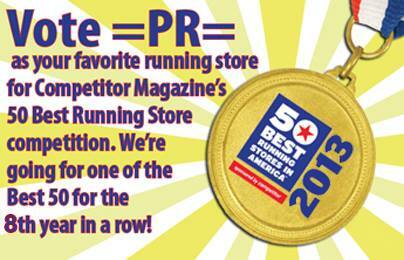 They're a local chain of running stores that have offered me great help personally and run a great set of races. They've actually been a part of both the 8K and 10K I've run so far. They've been voted one of the top 50 for the past 7 years in this list by Competitor. The nominations / votes are now, so I ask for help to put them in there again. And, you have the opportunity to put your local store in there as well. If they've helped you, put their name in the running to help say thanks. Vote now. That is all.